Too much sun exposure leads to sun damage. Sun gives off ultraviolet (UV) radiations that damages your skin and causes sunburn. These UV rays can damage your skin in two different forms, UVA rays (the aging rays) and UVB rays (the burning rays). UVA rays deeply penetrate into the skin-damaging the fibers in your skin called elastin and collagen causing wrinkles, age spots, scaly patches and even possibility of skin cancer. While UVB rays mostly affect the outer layer of the skin causing sunburns and tanning. - Sunscreen, the product to prevent the sun's UV rays from reaching the skin. - The broad spectrum sunscreen protects you from both UVA and UVB that may harm your skin. - Sun protection factor (SPF) is the UVB protection offered by product to the skin. - PA stands for the protection grade of UVA rays. It tells the amount of protection offered by a product from UVA rays. - The “+” sign in sunscreen signifies the level of UV protection. The more “+” signs mean a higher level of UV protection. - Sunburn: A type of skin burn resulting from too much exposure to sunlight. Repeated exposure increases the risk of other conditions such as wrinkles, dark spots, and skin cancer. Symptoms include red, painful, itchy skin that's hot to the touch. The skin may also blister. - Photoaging: Premature aging of the skin caused by prolonged sun exposure, specifically UVA and UVB rays. - Age Spots: Age spots are caused by overactive pigment cells. Ultraviolet (UV) light accelerates the production of melanin. On the areas of skin that have had prolonged sun exposure, age spots appear when melanin is produced in high concentrations. - DNA damage: Direct DNA damage can occur when DNA directly absorbs a UVB photon, or for numerous other reasons. - Skin cancer: Too much UV radiation from the sun or sunbeds can damage the genetic material (the DNA) in your skin cells. If enough DNA damage builds up over time, it can cause cells to start growing out of control, which can lead to skin cancer. - Evenly spreads to provide uniform protection and won't let the components of sunscreen to get absorbed into the skin. Provide advanced protection to improve the appearance of fine lines, wrinkles and promote a naturally even skin tone by neutralizing damaging free radicals that prematurely age skin. The heat produced by infrared rays from the sun, fiber telecoms, remotes, radiant heaters generate free radicals that cause collagen breakdown and may accelerate skin aging. 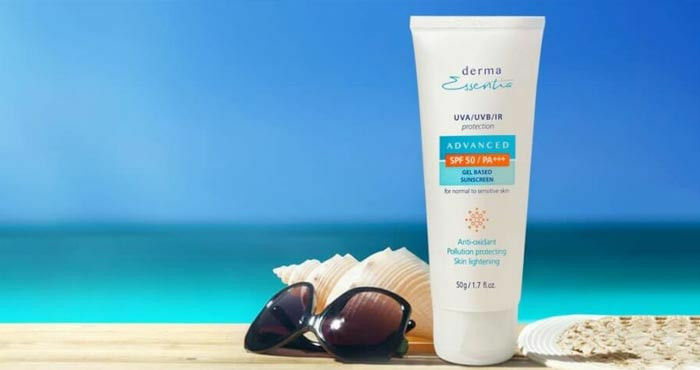 The natural extract, Thermus Thermophillus Ferment Extract in Derma Essentia SPF 50 Sunscreen Gel defends your skin from such free radical damage. The natural mixture of extracts (Saxifraga Sarmentosa Extract, Vitis Vinifera Fruit Extract, Morus bombycis root extract, Scutellaria baicalensis root extract) in Derma Essentia SPF 50 & PA+++ sunscreen gel gives a powerful skin-lightening effect on skin and thus protects and reduces age spots. A natural polysaccharide, Biosaccharide Gum-4 forms a breathable layer over the skin that protects it from major pollutants like car exhaust, smog, dust, and dirt, thus reducing wear and tear to your looks.